You know how you sit on the couch with your spouse on a Saturday night and make all these great plans for the next day….but then those plans get altered because one of the kids involved in those plans makes OTHER plans? So the next morning you drink your coffee and come up with different great plans for the day….and everything is going smoothly until you end up in the ER? Trevor made plans Saturday night to go to the skate park in Newberg with some friends early Sunday morning. This is his third time to go to that particular park, which is a good 35-40 minutes away from home. We realize the risk with partaking in an injury-prone sport/hobby, and the added discomfort and pain in doing this activity NOT close to home should there BE an injury. We’ve had this conversation because we’d seen it before. A few weeks prior; I took the kids to the Tigard skatepark and a boy there fell and broke his arm. There were other adults there who tried to help him, but ultimately a call was made to his mom and he had to wait for her to show up and take him to the doctor. It seemed like it took forever, and he was moaning and groaning the whole time, obviously in extreme pain. 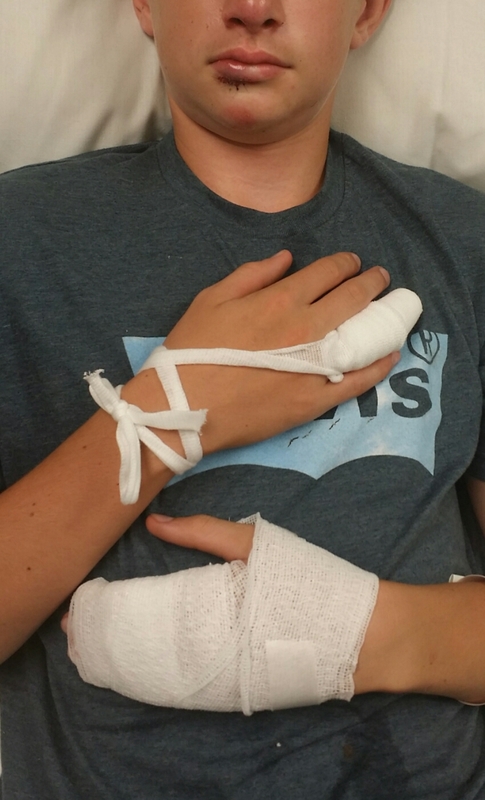 So yes, we’ve had the discussion…..Trevor knows if he gets hurt….bad….it’s going to take me a long time to get there. And it’s not going to feel good. So the call comes in at 10:20am. I recognize that it is Trevor’s number and the thoughts run through my head: Is he hurt? Is he calling to make alternate plans for the day? Does he need a ride home? Are the bullies back at the park trying to start a fight again? And then the voice on the other end says, “Hi, Trevor’s Mom? This is Andrew, Trevor’s friend” and I’m thinking…..oh no. How bad is it? He proceeds to tell me that Trevor crashed pretty hard and that his nose is bleeding and his mouth is bleeding and Trevor wants me to come pick him up. I ask him how bad it is, should Trevor go to the doctor or have 9-1-1 called? He says no. Trevor just wants me to come pick him up and to please bring towels. I tell him that I’ll leave right away, but that it will take me 40 minutes to get there and I don’t even know where this particular skate park is! A quick Google- I find it. Then I grab the two bags of corn kernels out of the freezer (un-popped popcorn kernels make great flexible ice packs for injuries!) and I throw those into Riley’s lunch bag, grab a couple towels, then call Jim to let him know that I’m leaving, and he says to take his car (which saves us at least 8 minutes simply because it’s the Ultimate Driving Machine and handles corners super well, unlike the Expedition which would require taking those corners extra slow). I made it to the skate park in about 34 minutes. Trevor’s friends are helping him walk over to me, getting him to the car, putting his backpack and scooter in the trunk. His face has been wiped but still has a lot of blood on it- his nose, mouth and chin. His hands are bloodied. 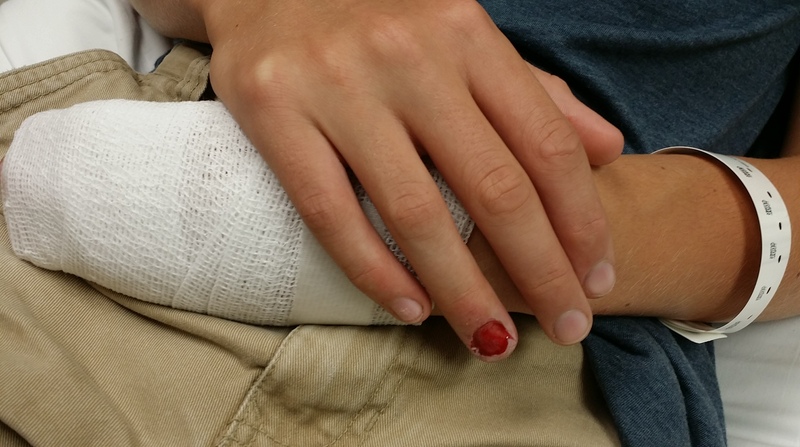 His friend tells me to check out Trevor’s fingernail- they think it might be missing. I can’t tell at a glance, there’s a lot of blood there. Trevor grabs a towel to hold on his hand and puts the ice pack on his face and says he can’t talk- it hurts to move his mouth. He tells me he bit his lip really bad and thinks he might have bit through it. I ask him if anything else is hurt- besides what I can see- he says no and we drive home. I tell him to go scrub up- it’s going to hurt, but we can’t see how bad anything is until he cleans up. We look at his right hand ring finger- the one that has nail damage. 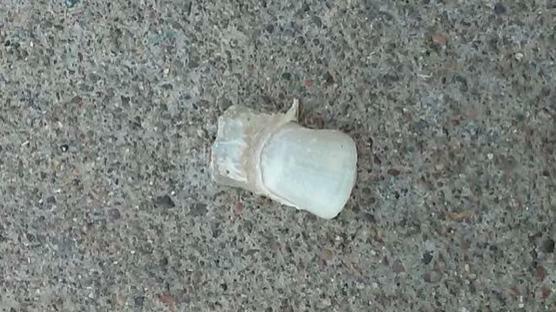 It looks like the nail is totally gone, but we can’t tell for sure. It’s bright red- he can touch it and it doesn’t sting or anything and he says it feels hard like the nail is still there, but it doesn’t look right. We decide the nail is probably gone. There’s nothing that can be done with that- either a new one will grow, or it won’t, either way it will be fine. We smother it with anti-bacterial ointment and cover it with a bandage and cover his finger with a cot. His other hand has about 20 abrasions. We smother each one with anti-bacterial ointment and there’s too many to cover, so we just leave it to air out. Then I go to do his lip. As I touch it to apply the ointment, it separates….a much deeper and larger separation than I am comfortable with. It’s deep and jagged and about an inch long (about 1/3 of his lip). I tell him we need to have dad look at it… I think this is ER worthy. Jim quickly agrees without even really looking at it. We decide to go to the Tuality Urgent Care just up the road from us. Sadly, the wait was long. While we were there waiting, Trevor had his head down, resting his head on his arms which were crossed over his knees. Suddenly he sits up and with a hand cupped under his chin he says that his lip has started bleeding again. I look at his lip and um, well, that’s not blood. That’s saliva, stained with blood. This pretty much confirms for me that he’s leaking through his lip from his mouth! Uck! They finally call us back to have him examined. By then his mouth and nose are quite swollen…. They can’t X-ray his face/head, but she’s concerned that he may have broken his nose. She does her best to feel around and says everything seems solid and fine, there’s no sign of anything broken- even if his nose IS broken it’s a super minor break. She’s really surprised he doesn’t have MORE injuries. Trevor is still somewhat in shock. He’s shaking and says he doesn’t feel sick or anything, just can’t stop shaking. She talks to him and works on trying to calm him down. (After the fact we got a statement from our insurance that shows he received an ADRENALIN EPINEPHRINE INJECTION , which I don’t know if he got that there or at the ER, neither of us recall him getting any shots). Anyway, she was really focusing on getting him to relax, because in order to ‘fix’ him, it was going to hurt, and it wasn’t going to be any fun. She summoned an assistant to come clean Trevor up and properly dress his wounds. They had him soak his hands for a while in some sort of sterile bath….then proceeded to SCRUB them with an abrasive sponge! O.M.G.! The poor kid! When they finished dressing his hands, they started scrubbing his face and when that was clean, the doctor came back in to assess the damage. Her concern- if it’s a gash on the outside or a gash on the inside, or a gash on both the outside AND inside but not clear and clean through….they can fix it here. 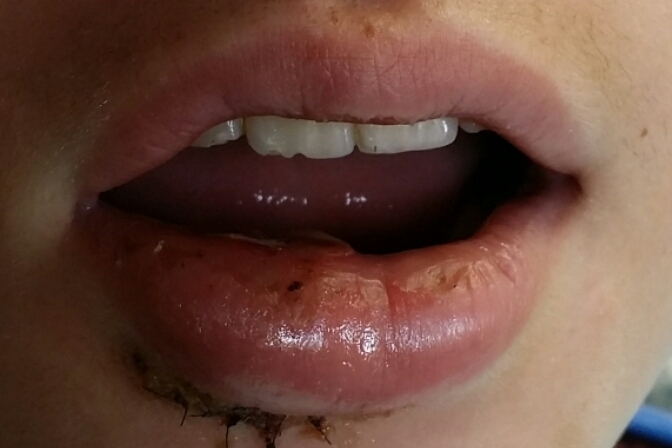 If the lip is completely torn away and separated, then we have to go to the ER. If you are squeamish…skip this paragraph: She slathers his mouth with a novocaine type gel to numb it, then starts poking around and checking it out, eventually grabbing a medical q-tip and shoving it into his lip……and exclaiming with a “Wowwwwwwww” when it pokes through into his mouth. She asks if I want to take a picture of that- I tell her no way. I glance up quickly, just enough to see the q-tip going into his lip and coming out the other side going into his mouth…..uck. Anyway, she tells me we have to take him to the ER and she sends them a notification/referral that we are on our way. She applies more numbing agent to hold us over and sends us out the door. We get to the ER, thankfully there’s only 2 people ahead of us, so we were in quickly. And there was hardly anyone there- dare I say the ER was dead? At one point Trevor had about 4 people working on him, out of sheer boredom because there were no other patients! The first thing they do is undress his torn fingernail hand and inspect that- determine that indeed the nail is completely gone and they need to put some ‘packing’ at the nail bed to keep the skin open there, otherwise it will heal shut and the new nail won’t be able to grow through it. They decide to save that for last. He inspects Trevor’s face, says he doesn’t think an X-ray is needed, that it’s likely that his nose is fractured, but it’s straight, he can breathe, his face structure is still solid, so there’s really nothing they would do for it anyway. He said we’ll know in a couple days whether or not it’s broken- once the swelling goes down and the pain increases. He inspects Trevor’s lip next, says he doesn’t think it’s cut clear through, I tell him it IS, that I SAW it, he acts like he doesn’t believe me, but then upon further inspection confirms that yes, it is split clear through. They give Trevor a novocaine type injection and start stitching his lip, the outside first, giving him 4 stitches. Then he does an internal stitch (between the inside and outside of his mouth- like INSIDE his lip), then adds a couple stitches to the inside of his mouth. Then decides he doesn’t like the work that he did on the outside, so he takes all the stitches out and re-does them, this time giving him 6 stitches. They send us home with instructions to remove the packing from his nailbed in three days. Keep all the dressings dry, irrigate his lip injury, and come back (or go to another doctor) in 5 days to have the stitches removed. Trevor is in a lot of pain, obviously. Eating is a challenge- he can’t open his mouth very far, can’t use a spoon, can’t chew without chewing on his lip…..and whatever he eats gets stuck inside his lip and needs to be irrigated out. Smoothies. He does go to school on Monday. Tuesday night we were able to see his dentist, and she confirmed that he had chipped THREE teeth. We got those fixed. Wednesday night we tried to clean his finger and remove the packing, but neither of us knew what we were looking at and it was pretty gross and we were both too squeamish to dig around, so Thursday I was able to get him into his regular doctor- he removed the packing, and also removed the stitches from Trevor’s lip. Ugh. I’ll keep you posted on how this all turns out!